Electronics, such as televisions, computers, and computer monitors, contain toxic substances, including lead, mercury, cadmium, lithium, brominated flame retardants, phosphorous coatings, and PVC plastics. When thrown away these devices can release their toxics, posing a threat to human health and the environment. Because of the threat posed by these toxics, it is illegal to throw away cathode ray tubes and LCD screens in Maine. Electronics also contain high quality plastics, copper, aluminum, and small amounts of silver, gold, and other precious metals. Mining and processing these the materials is energy intensive and environmentally detrimental. By recycling your old devices, you can prevent the release of toxic substances and ensure valuable materials are recovered. From January 2006 through December 2017, Maine residents recycled more than 97 million pounds of electronics with the help of electronics manufacturers! Households, K-12 schools, small NGOs and businesses: Maine households, elementary and secondary schools, businesses with 100 or fewer employees, and 501(c)3 nonprofits with 100 or fewer employees can recycle much of their e-waste at little to no cost through Maine's product stewardship program – scroll down for more information. Other entities: Other entities cannot recycle electronic waste through the program, but their e-waste can – and sometimes must – still be recycled. Some electronic wastes are regulated as hazardous waste when generated by businesses, including electronics that contain cathode ray tubes, mercury lamps, and circuit boards. Electronics leaving large businesses often have value in the reuse market, in which case businesses can direct their material to a company performing asset management – check with your electronics recycler to find out if they offer this service. Universal Waste Management Companies (PDF) can also ensure electronics from large businesses are handled and recycled in accordance with all regulatory requirements. For more information on the handling of electronics by Universal Waste Management Companies, contact the Hazardous Waste staff at (207)287-7688. 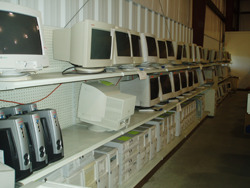 Under Maine’s product stewardship program for e-waste, manufacturers pay for the recycling of televisions, portable DVD players, game consoles, computer monitors, laptops, tablets, e-readers, 3D printers, desktop and portable printers, digital picture frames, and other visual display devices with screens of at least 4 inches measured diagonally and one or more circuit boards. Cell phones are not included in this program but may be recycled at the retail locations of cell service providers. Electronic accessories are not covered by the program but are often accepted at sites that accept the covered devices listed above. Municipalities ensure that their residents have a collection site or event that will take these "covered electronic devices" for recycling. Some collection sites charge a small fee to help cover their costs of operation. Households, elementary and secondary schools, and small businesses and non-profits are responsible for bringing their e-waste to a collection site or event. Electronics collected through this system are consolidated and sent for recycling by companies approved by the Department of Environmental Protection (PDF). Processing meets strict environmental standards and results in the reclamation of all useable materials. Recycling locations - some collection sites charge a small fee to cover their costs of collection. List of collection sites by town (PDF) The blue blocks signify that sites will take material from anyone in the state, not just from the residents of their town. Please contact your local facility to check for up-to-date information on hours and items accepted. The “Help ME Recycle” map can help you find collection locations near you. In addition to the permanent collection sites, there are one-day collection events throughout the state during Spring, Summer, and Fall. Call DEP at 287-8556 to get more information on these events. 38 M.R.S. §1610 - Electronic Waste -This version of Maine’s law includes the changes made by Maine’s 2011 and 2018 Legislatures. For more information on recycling and disposal of electronic waste from households and schools, contact the E-Waste Program staff at (207) 287-7688.